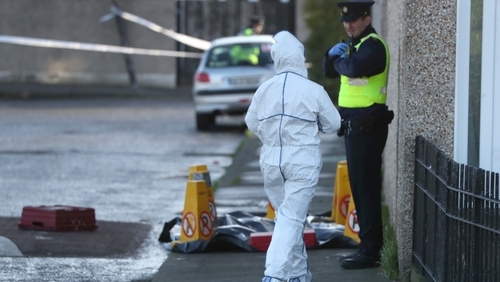 Gardaí are appealing for witnesses after a 39-year-old man was shot dead in north Dublin this morning. The shooting happened at Marigold Crescent in Darndale at around 6.25am as John Lawless was leaving for work. Mr Lawless was shot a number of times outside a house. He was treated at the scene by ambulance personnel before being taken to Beaumont Hospital. The suspected stolen getaway car - a 132D silver Ford Focus - was found burned out about 2km away on Greenwood Avenue. Two scenes were examined today - the scene at Marigold Crescent where the shooting took place and the scene at Greenwood Avenue where the car was located, according to Superintendent Gerard Donnelly. A post mortem examination is currently taking place and is being performed by the Deputy State Pathologist Dr Michael Curtis. The victim, who is a father-of-three and whose partner is expecting another child, is not known to gardaí for involvement in serious or organised crime. Detectives do not believe the murder is related to organised crime or the ongoing Hutch-Kinahan feud and while they are keeping an open mind as to the motive, they believe it is more likely connected to a local issue. Supt Donnelly said no firearm has been recovered, yet but that gardaí believe the weapon used was a handgun. He said gardaí are following a number of lines of inquiry. He appealed for the family's privacy to be respected. Gardaí have appealed for anyone with information or anyone who may have witnessed the incident to contact the incident room at Coolock Garda Station on 01-6664200 or any garda station. They particularly wish to speak to motorists with dash cams who were in the Darndale, Malahide Road or Blunden Drive areas.